Airdrieonians' Gary Bollan and Peterhead's Jim McInally have been named managers of the month for March in their respective divisions. Bollan led his side to three wins and a draw in League One, their only defeat coming away to champions Rangers to edge out of the relegation places. McInally's Peterhead won five and lost only one of their March matches and have now clinched the League Two title. Striker Rory McAllister also won the SPFL player of the month award. McInally insisted that there is more to his side than merely being well-organised. "Rory being recognised has helped to show how well we have been doing as a team," said the former Dundee United midfielder. "Up until now, the players hadn't really got the credit they deserve. "They have won a phenomenal amount of games and it has gone under the radar a little bit. "If you add the run of 10 games last season to this season's results, we have won 30-odd games over the past 12 months. Opponents say we are organised and strong, but it is more than that." Peterhead also had four players named in the SPFL League Two team of the season, with McAllister joining Graeme Smith, Steven Noble and Andy Rodgers in the side. "Winning these awards can help to recruit players," said McInally. "It is good publicity for the club and brilliant for our profile. "We have a lot of players from the west and word goes out that it is a good club, we look after our players and we are trying to make it a place everyone enjoys being. "We have the nucleus of a good squad. We will have to improve again and bring in two or three players of decent quality. "The set-up at Peterhead is fantastic and we are going up to the league we should be in. "The structure and organisation is better than many other places due to the hard work of the directors and office staff. This is not your normal league two club." Bollan is doing his bit to ensure that Airdrieonians will not be replacing Peterhead in League Two and they are now seven points clear of East Fife in the second-bottom place that brings with it a play-off to avoid relegation. 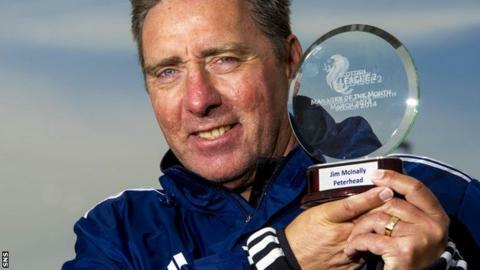 The former Livingston boss said: "It's great, but the award's not just for me. It's for the players as well. "After the early part of the season, they learned they had to earn the right to win and they've absolutely done that, so credit to them. "Since the turn of the year, the boys have worked extremely hard and that's definitely been paying off, particularly over the last month."